It's time to get the house looking festive for the holidays! 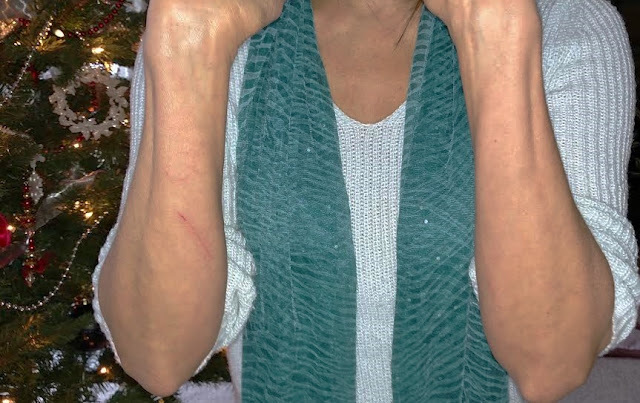 That means putting lights and decorations not only on indoor Christmas trees, but on outside trees and bushes as well resulting in scratches and rashes on hands and arms in the process! It happens every time for me with both real and artificial trees. People can be allergic to the sap or rosin that evergreen trees produce causing painful, burning rashes on the skin. It can be similar to a poison ivy rash for some people. The pricks and scratches from the pine needles exacerbate the allergic reaction. The sap may not be the only allergen. 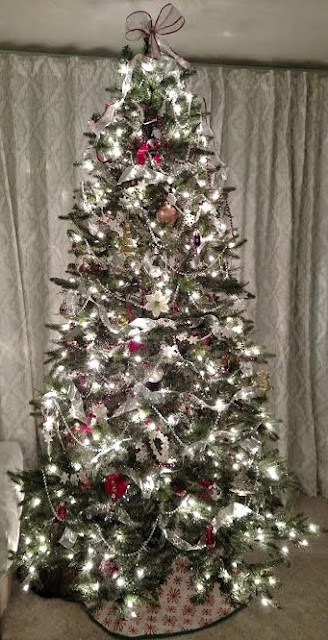 Real Christmas trees can have pollen, mold and fungus on them which can cause skin rashes and other allergic reactions. There can be many different types of mold living on a tree. 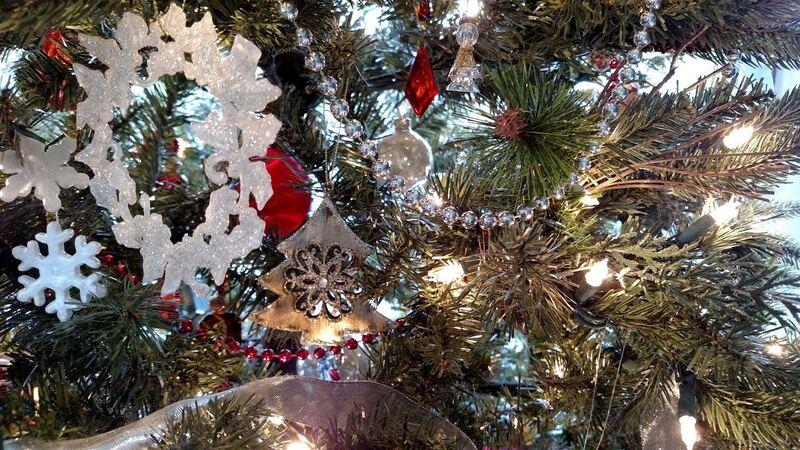 Researchers found more than 50 different molds on Christmas trees!!! That is super bad news for allergy sufferers. Christmas trees can also be sprayed with chemicals to help preserve them. The many allergens that cause rashes can also cause serious breathing problems for those with asthma and allergies. I know this first hand because my daughter ended up in the ER with a serious asthma attack after babysitting a family with a real Christmas tree. There are some things you can do to reduce the allergens on a real Christmas tree before bringing it into your house. Give the tree a good shaking and bang the trunk of the tree on the ground to remove loose allergens such as pollen. Some Christmas tree sellers have a machine that shakes the tree to remove the allergens plus the loose needles. You can also blow it off with a leaf blower. Give the tree a good hosing down outside. Let it drip dry, them move it to the garage to dry off for a couple days. So how about an artificial Christmas tree? It will definitely reduce the possibility of allergic reactions. But, you may not be totally safe from allergies with an artificial Christmas tree either. People can be allergic to the dust and dust mites that cling to artificial trees. Mold can also be a problem if the artificial tree is stored in a damp basement. Allergic people get a easily rash on their hands and arms along with irritating scratches. The rash from your Christmas tree, whether it's a real tree or an artificial one, may not an allergy at all. It can simply be irritation from the skin being pricked and scratched. Like I said, I also get scratches and a rash from decorating the Christmas tree, especially when only half of the pre lit tree is lighting and I have to dig through the branches and find the bad bulb. Uggggh! You would think I would learn after all these years of decorating experience, but I just jump right into the decorating full of creative energy not worrying about the scratches, till later when they start stinging! 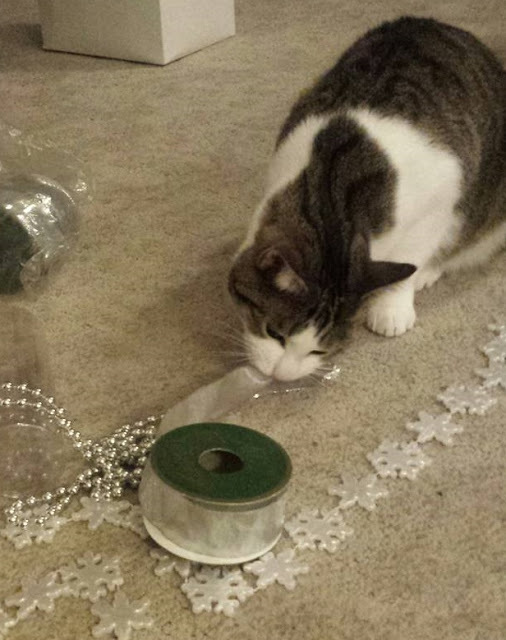 Plus, this year I have another tree to decorate. I've added this cute pencil tree in my dining room that is so easy to put together and decorate. I love that it fits perfectly in the corner and takes up very little room. 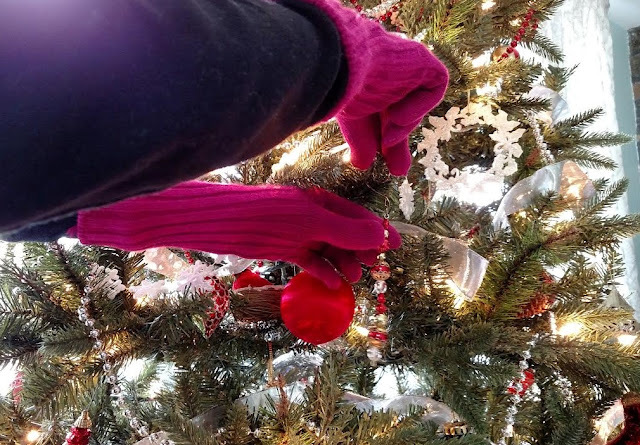 Wear gloves and long sleeves when decorating trees. Long sleeves tucked into the gloves will give you the best protection. If you happened to get scratches and rashes, there are a few things you can do to help your skin heal. Remove the gloves and long sleeve shirt after the decorating and put them in the wash. Wash your hands and arms to remove any allergens. Apply an anti histamine cream such as Benedryl cream, calamine lotion or hydrocortisone cream to soothe an allergic reaction rash. A severe poison ivy type reaction may require medical attention and oral anti histamines. Apply an antibiotic ointment to the scratches to prevent infection and help them heal a little quicker. Wear gloves and long sleeves when cleaning and assembling the tree. Open the box that stores your artificial tree outside. Vacuum your artificial tree to remove dust. Use the brush attachment on your vacuum to gently go branch by branch from top to bottom if the tree is assembled. It is easier to vacuum before it is assembled. Do it outside if you can, otherwise put a plastic sheet to catch dust under the tree that you can dispose of after cleaning. You can blow the tree off outside with a leaf blower if you have a sturdy tree. A leaf blower is strong. It could damage a delicate artificial tree. I have used a blow dryer on the cool setting to blow dust off of my tree in the past. Use a damp towel to wipe dust off of artificial trees from top to bottom. You can add a bit of dish washing liquid or vinegar to a bucket of water. Dip your cleaning rag in and squeeze it out really well. You should not saturate the tree. Do it outside if you can. Let it dry thoroughly before decorating it and plugging in lights. Store the artificial tree in plastic bags or plastic boxes instead of cardboard boxes to reduce dust mites. Or maybe it's time to ditch your old tree full of allergens and start fresh with a new tree. Especially with all the great cyber sales going on at Christmas time! You can get all different sizes of Christmas trees including pencil trees at great prices on Amazon! Shop for a new Christmas tree. ﻿﻿﻿Have a Beautiful, Healthy Day!